San Andreas isn’t a disaster movie after all. It’s less about earthquake terror and more about Dwayne Johnson’s ludicrous heroics. Dwayne Johnson is coming to save you. Ray (Johnson, G.I. Joe: Retaliation) is a wicked talented helicopter pilot for the Los Angeles Fire Dept. He’s got 600 documented rescues under his belt thanks to some super-savvy piloting skills, such as the ability to shimmy a chopper down a super-tight canyon. That rescue collection gets a plus one as the movie begins. A teenage girl drives through the curvy San Fernando valley, multi-tasking all the way. Grabbing a water bottle out of a bag on the floor of the passenger side and texting in the face of oncoming traffic, she’s a disaster waiting to happen. It’s like a “don’t text and drive” commercial by the time her car winds up precariously wedged on the side of a canyon wall. And the opening sequence quickly demonstrates where the movie is headed: Extravagant rescue scenes in the midst of disaster and natural dangers. This isn’t exactly the territory of Irwin Allen (1970s disaster flicks) or Roland Emmerich (whether intentional or not, his movies tend to be a disaster). The disaster elements are a convenience factor. They’re a device for making characters disappear and they set up the terrain for Ray to perform ludicrous feats of heroism (all in mediocre, albeit sometimes decent, 3D). The earthquake activity begins with a rumble at the Hoover Dam that registers as a 7.1 on the Richter scale. As it happens, Paul Giamatti (Sideways) plays Lawrence, a Cal Tech prof who’s working on a way to predict earthquakes. He gets his eureka moment at the dam and thanks to his gung-ho students, hacks into the L.A. broadcast airwaves in order to warn the masses of the magnitude of the quakes coming their way. The “big one” is something that should happen every 150 years, he warns, and, well, California’s 100 years past due. Lawrence works on predictive earthquake technology. Perhaps his students should work on ways to thwart predictable storytelling. 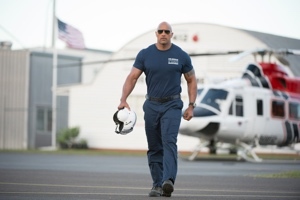 Can it get much more ridiculous than watching Johnson singlehandedly pilot a helicopter while also rescuing his estranged wife from the top of a collapsing skyscraper in downtown Los Angeles during a historically devastating earthquake? The action has Ray trading down from the helicopter to a hot-wired truck (convenient) then trading back up to an airplane (a sweet deal made with an unlikely older couple). Oh, and Ray crashes the plane into the San Francisco Bay, parachuting (along with his wife) onto the field of AT&T Park, home of the San Francisco baseball Giants. That sets the stage to commandeer a speed boat, all in the name of rescuing Ray’s own daughter, Blake (Alexandra Daddario, Percy Jackson: Sea of Monsters). The man does it all, but can he survive the family drama? HIs wife has filed for divorce and moved in with Ioan Gruffudd (Fantastic Four). Gruffudd plays Daniel, a wealthy real estate developer, who is also one of the absolutely most worthless characters to grace the screen in decades. That’s not a spoiler. That’s the shallowness of the story. He’s supposed to be hated, but his fate is less of a cheer-generator and more a “what the heck?” moment. A bit of gravitas is thrown in by way of a tragic backstory involving Ray’s other daughter. It helps build up the tension during the movie’s climax, but San Andreas doesn’t have the guts to let the drama go full tilt. That’s where those Cal Tech kids could help out with some predictable narrative studies. As for Ray’s wife, Emma (Carla Gugino, Watchmen), she looks a little ragged after escaping from the skyscraper. But, within one scene, she’s looking cleaner - and cleaner still while en route to San Francisco to rescue their daughter. All without potty breaks or even a compact mirror for those facial touch ups. It’s silly stuff that feels more like a sequel to Johnson’s Hercules fiasco. San Andreas is Hercules sans cabello.